Desi Cullen was recruited by former UConn kicker Graig Vicidomino to volunteer at Paul Newman's "Hole-In-The-Wall-Gang" summer camp for ailing children earlier this month. He said he had a blast, but the experience touched him emotionally, too. Here's the full article from today's New Haven Register. STORRS — Desi Cullen, the fun-loving, spring-loaded starting punter at UConn, has enough energy and personality to fuel the entire football team. In two years since arriving in Storrs from his hometown of Louisville, Cullen has managed to inject his individuality, vigor and ever-present zest for living into each practice. 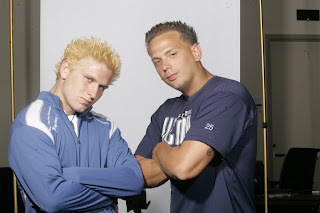 As a true freshman, he greeted Connecticut media for the first time with a heavy drawl and self-appointed nickname, “Y’all wanted to talk to the Kentucky Hammer?” A year later, he dyed his hair bright yellow — “irresistible blonde” as he called it — to help gain some attention for the oft-ignored UConn kickers during Media Day (see above photo). So when former UConn place kicker Graig Vicidomino volunteered to work with ailing children at The Hole In The Wall Gang Summer Camp a year ago, he knew he had to return this summer with Cullen. The camp, tucked away in the hills and expansive timberlands of Ashford and Eastford, was started in 1987 by actor and Westport resident Paul Newman as a retreat for children with cancer and other life-threatening diseases. There, they could enjoy every activity associated with an overnight summer camp on a lake in the woods. The experience was enlightening for Cullen, an elementary education major who has worked in the past at YMCA camps back in Louisville. They spent the week working with children ages 10-12 suffering from sickle-cell anaemia, a disease that affects the body’s red blood cells. Before the campers arrived, the volunteers went through an orientation process with doctors to learn about sickle-cell disease and how to keep the children safe. Most afflicted with the disease can take part in everyday activities, but Cullen said they needed to monitor the children’s body temperature to protect against various sickle-related crisis. They were also instructed how to handle a child who suddenly becomes ill, but there were also trained counselors, nurses and doctors available around the clock. One morning, around 2 a.m., Cullen said he was awakened to the sound of one of his campers who had lapsed into “sickle shock”, a painful attack that periodically affects those with the disease. Two of the counselors trained in the condition came to the camper’s aid and brought him to the infirmiry. Cullen said he was in his element the rest of the week with the kids, playing, joking around and running a non-stop commentary with anyone and everyone. He may have also converted a whole new crop of UConn football fans, partly due to the matching UConn arm and wrist bands the two distributed to children. At one point, they gathered the group for a kicking demonstration, booming footballs high and deep into forest. The toughest part for Cullen and Vicidomino came when the week was finished. They had to say goodbye. Most of the children cried because it was time to go, but they weren’t the only ones who’d grown attached. Chip Malafronte can be reached at cmalafronte@nhregister.com.